Samuel P. Huntington was a Harvard Professor and was the Director of Security Planning for the National Security Council in the Carter Administration. He wrote an article titled ‘The Clash of Civilizations’ to the journal Foreign Affairs in 1993 which created much debate and controversy. He then wrote the book ‘The Clash of Civilizations and the Remaking of World Order’. After the end of the Cold War he had noticed the rise of nationalism in the old Soviet bloc countries and certain countries which were at war were supported by the countries with similar religious backgrounds. He noticed that this phenomenon was prevalent throughout the world and identified various cultures and called them civilisations. According to him the major civilisations in the world are Western, Islamic, Confucian, Japanese, Hindu, Buddhist and Orthodox civilisations. He suggested that the new world order would be the clashes among these civilisations. His thesis was criticised heavily and it was equally supported. One argument against the thesis was that it ignored the multiple dimensions of identity that overlap across the so-called civilisational boundaries. Greet Hofstede, a Dutch social psychologist identified initially four cultural dimensions across the word namely Individualism-Collectivism, Power Distance, Masculinity-Femininity and Uncertainty Avoidance. These are common traits across the nations but the populations of the nations are biased towards certain directions of such traits. For instance east Asian cultures whether Hindu India, Confucian China or Japan are more collectivist in comparison to Western individualist cultures. In his thesis he mentioned that the clash between Sinhalese and Tamils in Sri Lanka is a clash of civilisations which means it will be never-ending. The things happening in Sri Lanka today and things that happened throughout the history of Sri Lanka after independence prove that his thesis is correct. However the purpose of this article is to inquire into the history and see whether such a clash of civilisations were prevalent in Sri Lanka. The Mahavamsa – Great Chronicle – was an epic poem written in 5th century AD about the kings of Sri Lanka considering Dutugemunu as the main character. Out of 37 chapters 11 were reserved for Dutugemunu. The Mahawamsa says that Elara was a king who ruled “with even justice toward friend and foe, on occasions of disputes at law”. The way he handled the law enforcing process was unparalleled even in today’s standards. He also had very good relationship with Buddhist clergy and his army comprised a of fair number of Sinhalese. History is taught in Sri Lanka over-emphasising the Dutugemunu-Elara war. This emphasis ignored the total picture and the way Dutugemunu handled it. He has taken the Buddhist clergy to place in the areas won by his army in order to promote reconciliation. When he realised that a lot of soldiers from both sides were dying he suggested a solo fight with Elara to decide on the victory of war which was accepted by Elara who was over 60 years old at that time compared to young Dutugemunu. After Elara fell, Dutugemunu ordered that a monument be erected in the name of Elara and prohibited passing that place in a vehicle. The graciousness of these two men was not emphasised by our historians. Most Sinhalese think that Elara has done much damage to our civilisation compared to Kalinga Magha who was not a Chola and who came from the same state where Vijaya came from. In 13th century Magha ruined our civilisation which prompted Sinhala kings to shift the capital from Polonnaruwa to the south, paving the way to have a separate kingdom in the north. There were different kingdoms in the country at different times. Throughout history in Sri Lanka there were fights among the princes and kings. It was the same in South India as well. The fights were among the Sinhala princes and sometimes between the Sinhala and Tamil princes. Sometimes Sinhala princes brought forces from South India to fight fellow Sinhala princes in Sri Lanka. Sri Lankan kings sometimes had very good relationships with Pandyan kingdom in South India and they got together to fight Cholas. Certain Sinhala kinds invaded South Indian kingdoms. There were Dravidian kings ruled the Sinhala kingdom. Some were kings with foreign origin such as Nishshankamalla. There were marital connections among Sri Lankan and South Indian royal families. In the Polonnaruwa era Hindu gods encroached the Buddhist temples and the bull, a sacred animal of Hinduism, disappeared from the ‘sandakadapahana’. Even today most of the Sinhala Buddhists worship Hindu gods more affectionately compared to worshipping Buddha. King Vijayabahu who fought a decisive fight with the Chola invaders had to erect rock scripts in Tamil for the benefit of the Tamil soldiers who fought along with him against Cholas. Therefore there was no rivalry among Sinhalese and Tamils. Rivalry was among the kings and princes for power irrespective for their ethnicity. However, after the invasion of Magha in the 13th century there was a distance created between Sinhalese and Tamils. Under British rule there was renaissance movements spearheaded by Anagarika Dharmapala in the south and Arumuga Navalar in the north. Both of them had limited visions for Sri Lanka compared to the visionary leadership in Indian independence struggle. They focused on their own communities. Anagarika Dharmapala was initially worried about the pathetic state of the Sinhalese and their poor economic power. Coming from a business family he wanted the economic superiority of Sinhalese against the other communities. Therefore, he criticised especially Muslims. He emphasised the identity of Sinhala Buddhists. He criticised the backward habits of Sinhalese. This was done by Mahatma Gandhi also at the initial stages of the independence movement. At one speech with Sarojini Naidu in the chair, Gandhi criticised the habits of Indians such as spitting in public places. After some time when he was going into detail he was asked to stop his speech. “Englishmen dominate the cultivation of tea and rubber. Trade is with Moors and Tamil. Why Sinhalese are engaged in liquor business which destroys all of us?” – Sinhala Bauddhaya 30 December 1911. During this time what was important was caste and not race. Ponnabalam Ramanathan who retired as Solicitor General of Ceylon in 1906 and who was a Tamil Vellala was brought in to contest the 1911 Legislative Council election against Sinhala Karava Dr. Marcus Fernando by Sinhala Govigama leaders to fill the seat of educated Ceylonese. Ramanathan won with the support of Govigama Sinhala and Vellala Tamil educated Ceylonese. Dharmapala’s introduction of Sinhala Buddhism has been taken forward by the Buddhist clergy to a very dangerous level subsequently. Even today they stay as a stumbling block to any sort of reconciliation mechanism. Sinhala Buddhism was politically capitalised by Bandaranaike in 1956. Gunadasa Amarasekara identified this as “Jathika Chinthanaya”. This so-called ideology divided the nation rather than uniting it. In the Indian independence struggle their leaders were able to unite the entirety of India. They fought against the concept of untouchables. Even after Jinna took away Pakistan, there were a large number of Muslims in India. However, Dharmapala’s intentions were different. “The person who would be sent on behalf of the King of England should be the Governor and a noble Englishman should be appointed as the Commander of Army. Judiciary should be handed over to Ceylonese. All offices such as Secretary General, Treasurer General, Government Agents and Korales of the Provinces should be handed over to born Ceylonese, Sinhala, Tamil, Burgher and English according to their strength. Income of Ceylon should be used to establish crafts, agriculture and commercial factories for the benefit of Ceylonese. An Army comprising of Sinhala, Tamil, Burgher and English should be established. Ceylon should manufacture marine vessels. Sinhalese should wish to follow the doctrine of independent state” – Sinhala Bauddhaya 30 September 1911 (translated by the writer). His omission of Moors seems to be intentional. Due to lack of unity and common goals for independence among the Sinhala and Tamil communities there were separate organisations established based on ethnicity. Later G.G. Ponnabalam introduced Tamil racism to essentially caste-minded Tamil polity. This racism was enforced by the Sinhala and Tamil extremists. Therefore, this is not a clash of civilisations. It is rather a misguided political campaign. Huntigton himself says in page 48 that Buddhism compared to other four religions – Christianity, Islam, Hinduism, and Confucianism – is not associated with a major civilisation. The reason he mentioned was that Buddhism which was divided to Theravada and Mahayana Buddhism was variously adapted to various cultures. In Sri Lanka it was Sinhala Buddhists who protected Muslims against the Western nations who were engaged in a trade war and gave land in internal areas of Sri Lanka. That is why Muslims are concentrated in Kandy. 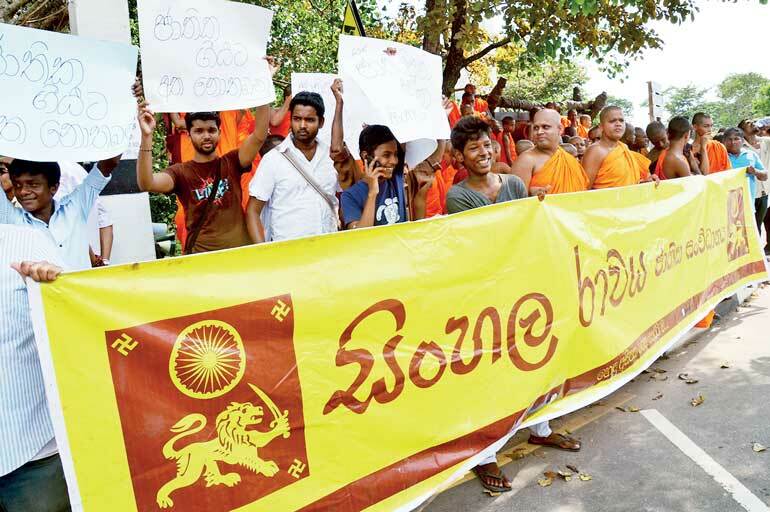 It was Sinhala Buddhists who protected Roman Catholics from Dutch Protestants. That is why Pope Francis was able to canonise Joseph Vaz. Therefore this misguided political campaign should come to an end. In reality there is no clash of civilisations here. We have lost enough opportunities. If we did not have the 30-year-long war in the case of Gross National Production we would be on par with Far East Asian nations. We have neither Gross National Production nor Gross National Happiness. This is how Red Indian leader Crowfoot described life: “What is life? It is the flash of a firefly in the night. It is the breath of a buffalo in the winter time. It is as the little shadow that runs across the grass and loses itself in the sunset.” The Buddhist clergy should learn from him, if they cannot learn from the Buddha.